Known as 'Kuruma-Yuri' in its native Japan, legend holds that this alpine species which grows in volcanic soils is the favorite flower of the �Goddess of Mount Fuji�. 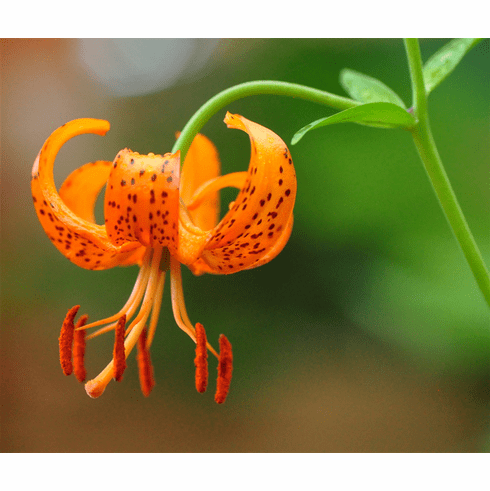 Often a difficult garden subject, the waxy orange, black spotted flowers of Lilium medeoloides are only about 1-1/2 inches in diameter. A planting site rich in leaf-mold on top of gravel with winter protection and semi-shaded conditions are a must to successfully grow it. Photo insert #1 is of wild L. medeolodies as photographed by Mr. Moto Shimizu of the Northern Japanese type and contributed to B & D Lilies. Inset photo #3 is plant grown by Gene Mirro. Copyright Gene Mirro, all rights reserved. Used with permission.